Monadnock 2630, 2631 26" Classic Friction Lock Baton Patrol Kit FREE SHIPPING! 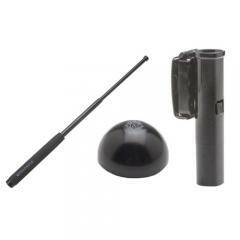 The Patrol Kit from Monadnock® combines three of their most popular products: 26-inch Classic Friction Lock baton, Hindi Baton Cap® and the Front Draw® holder. The baton is made from 4130 aircraft-grade, alloy steel tubing with precision-engineered Morse tapers, giving it extreme strength and locking it tightly when deployed. The baton opens rapidly with a single flick of the wrist to provide immediate tactical application. Using it with the optional Hindi Cap® improves retention and control. The cap locks onto the base of the weapon, providing a larger surface area for a more secure grip while preventing heavy impact from jarring it from hands. Finally, the clip-on Front Draw® holder is built from durable polycarbonate and includes a swivel clip that rotates through a full 360-degrees to suit preferred draw angles. It employs tension springs to securely hold the baton in place and can accommodate an open or closed baton. Awesome Great kit to start off with. I prefer the ball tip auto lock but that goes for 126 with no case and cap. Can't go wrong with this kit cheap, reliable and has everything you need to start. Cap case and baton. ©2002-2019 CopsPlus.com: Monadnock 2630, 2631 26" Classic Friction Lock Baton Patrol Kit FREE SHIPPING!